Below is our update on how many projects we have completed, started, or are still waiting. If a project is still waiting it may have a name next to it. Some may not because a few of them we are going to decide on later. As in previous update posts if the project name is colored pink it is in progress by Brittany and if colored green it is in progress by Em. If the project name is colored and crossed out that means it is completed. We will also have Pattern Entries linked next to each project as we update the blog with our evaluations and input on each pattern. Hello readers, this is Brittany! Yesterday, I finished the bobbles and cable cap. This pattern was another pattern that I knew I had to make almost from day one. 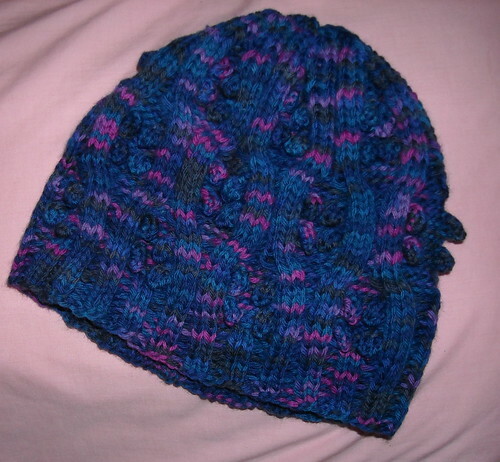 It could have been the purple in the book (as I have an addiction to the color purple) or the texture and look, but I just had to make this hat! As I do with almost every pattern, I first did a little research. This step is something I encourage everyone to do. If you are going to invest your time in making something it is good to see what other people found about the pattern and learn from others mistakes. After all, many people that blog about their projects or write descriptions on Ravelry are not just putting it up there for their health. They are documenting their mistakes or things they would change for themselves (in case they want to make that pattern again in the future) and in hopes that they can save other people from the mistakes they made. 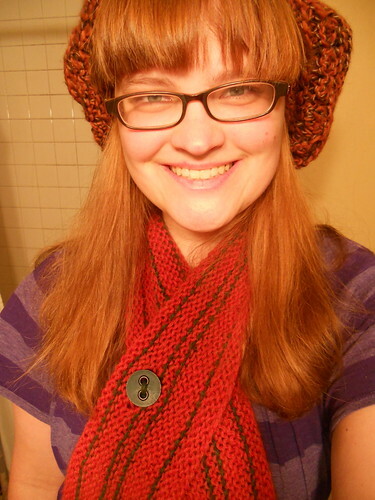 If you are looking to do some research on a particular pattern, I would definitely suggest first checking out Ravelry. 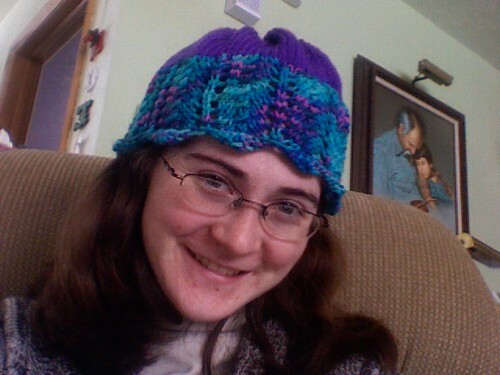 I am sure if you are reading this you probably already know all about Ravelry, but if you do not you should definitely check it out. You can learn a lot and meet a lot of interesting people. K1, p1 twice in same st, making 4 sts from one; slip these stitches back to left hand needle and knit them again; then pass the 3rd, 2nd and first sts over the last st made. Noreen1009 - The bobbles the pattern calls for are pretty puny--just increase 4 in one stitch (K1, P1, twice) and then pass the stitches over the last one in sequence. To me, it doesn’t look right. I’m doing a two row, 4 stitch bobble instead. (k1, p1, k1, p1 into one stitch; turn work and knit 4, turn work and purl 4, and then pass the stitches over the last one in sequence). 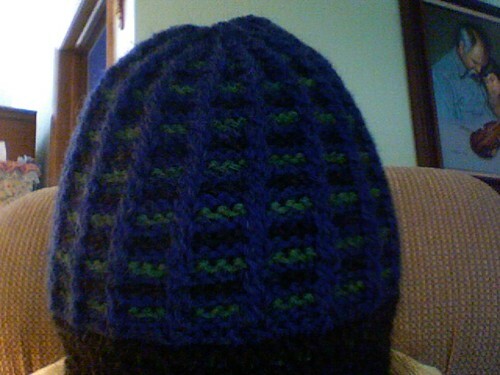 Hatlover - Modifications: Used Noreen’s Bobble to make it stand out more. Pprincess626 - Bobbles not big enough - but turned out cute! 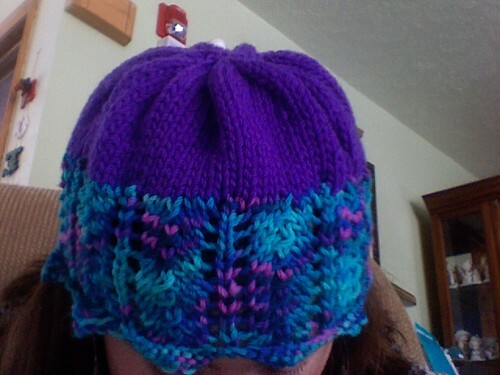 Bdorner - Got all the way to the decreases and decided the bobbles were too small. Since I saw so many comments about the bobbles I looked at pictures and experimented with different ways I could do the bobbles. I finally decided to make my bobbles the same way I did on the starfish cap. If you would like to do the same thing I did, here is the bobble pattern I used: K1, p1, k1 in same st, making 3 sts from one; turn. P3, turn. K3, turn. P3, turn. SK2P. In the end I really liked the way it came out. 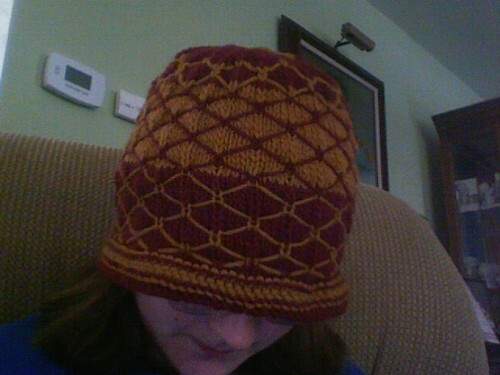 I would agree with some comments made on ravelry that it is a little big. 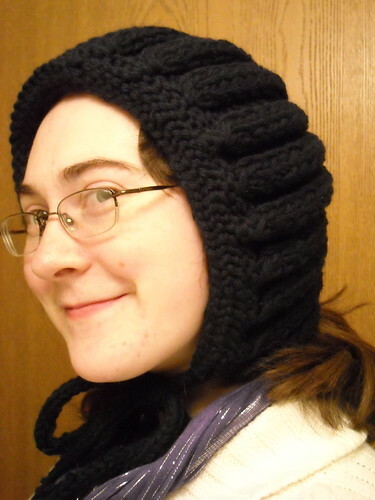 I would have liked it to be a little bit more snug, but I do not feel as though it will fall off my head. I hope you learned a bit about the importance of researching and I hope that my post helps you with your own project. If you would like to see more pictures of this project or any of my other projects check out my Flickr Account. Brittany and I are going to try to introduce ourselves at the beginning of the entry so you know who is talking! We are sorry if there was any confusion in prior entries. We will do our best to identify ourselves in the future!!!! The reason I bought this book...was because of these mittens!!! I love the cable mittens! Two of my friends in school requested for me to make them a pair. The first pair I finished are used with Eco Cascade. I won it last year at Stitches Midwest:) Since the yarn is a little finer (at least I felt it was) than the worsted 220, I feel my personal pair of these mittens are a little thin. 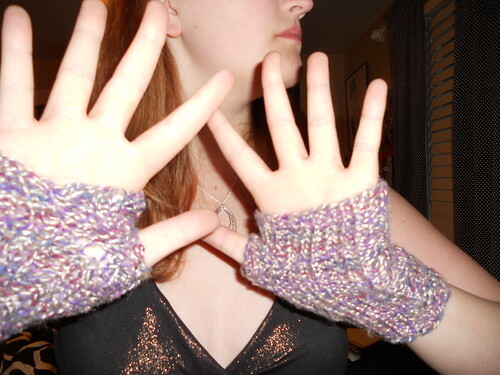 If I could go back I would have made these with an actual worsted weight yarn. 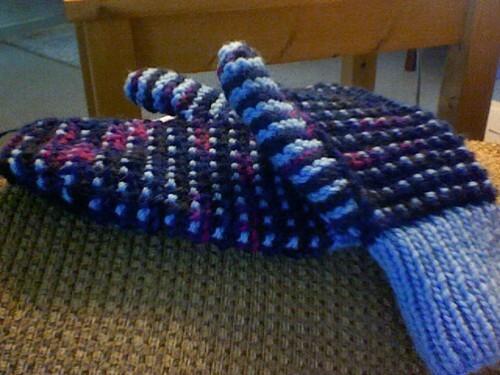 I think that is why the mittens are much smaller than the other pair too. I followed the pattern exactly and the mittens came out two difference sizes. 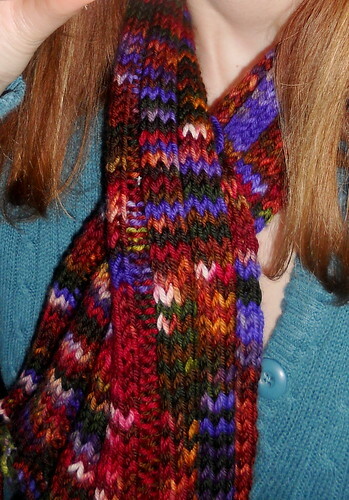 I don't have a picture of the other mitten, but when I finish them, I'll post a picture! The pattern is a little misleading. I thought the pattern went all away around the mittens. Turns out, it is only the top of the hand that gets the awesome pattern. That is okay, I enjoyed the fact it was only on part of the hand. When the other hand has just the st st it makes them different. Plus, it makes things fit in the hands nicer. 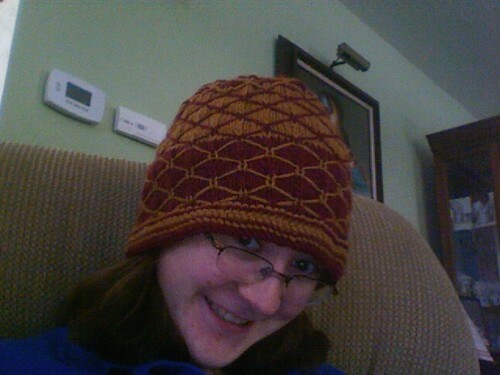 Once I got the pattern down, the knitting went by quickly. I liked how the cables were layed out like a checkerboard. It kept things interesting during the knitting. The thing I don't like about this pattern? The color changes. It's not the pattern's fault, I just don't like don't color changes. While Brittany doesn't mind the sewing, I do. That is because I am an epic failure at it. 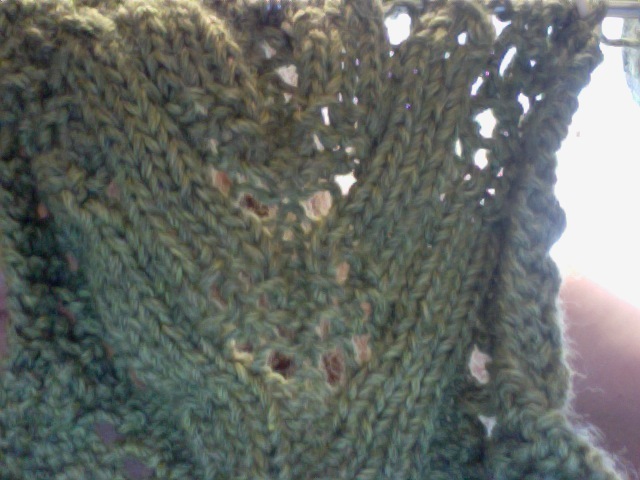 When I join yarn, there is always some kind of hole that I have to resew up. 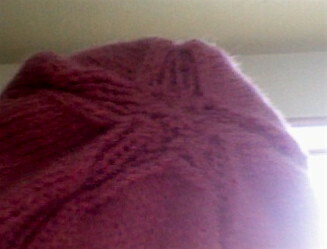 There have been times my knitting has come apart because the ends were cut too early. Now, I try to weave all my ends in, but I detest it greatly. I am just not a fan. Therefore, I was glad with my friend Angie mentioned she wanted these in one color. I didn't find these difficult. 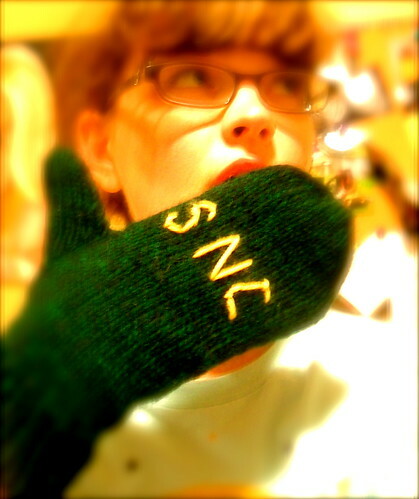 I would encourage first time mitten makers who are going to go beyond st st for the first time to try this knit. The cabling is simple and it looks so flashy! Em and I sat down last Sunday and went through the book. We decided which patterns we would complete to make it easier for us later. Below is our update on how many projects we have completed, started, or are still waiting. If a project is still waiting it may have a name next to it. Some may not because a few of them we are going to decide on later. As in previous update posts if the project name is colored pink it is in progress by Brittany and if colored green it is in progress by Em. If the project name is colored and crossed out that means it is completed. We will also have Pattern Entries linked next to each project as we update the blog with our evaluations and input on each pattern. 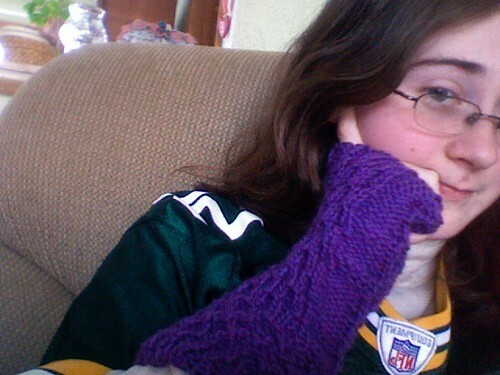 I love knitting mittens!!! They are some of my favorite things to make. I've been working on all sorts of different types of mittens. 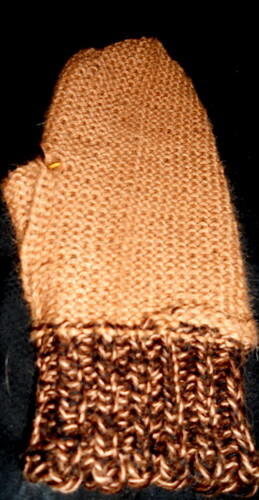 Most recently, I have been working on the Bunny Mittens from 60 Quick Knits book. Thus far, I love the pattern. It is simply written. They were also very quick to make. 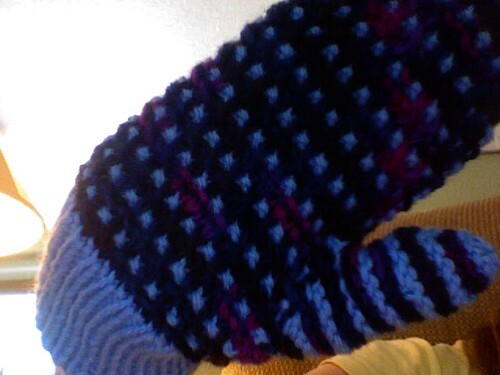 I made one mitten in only a few hours!!! I just finished off the pink nose only a few minutes ago. Where should these beautiful mittens go? I do not know any young girls that would benefit from these awesome mittens, so I am thinking of donating these mittens to the Green Bay Girl Choir Art Gala Fundraiser. The girls need arts and crafts to be autioned off. This will help girls who are not able to afford Girl Choir to have financial opportunities to join the choir. I need to pick up some buttons for my bunnies eyes. I'm thinking of some tiny pastel pink buttons. The tiny ones that go on men shirts. 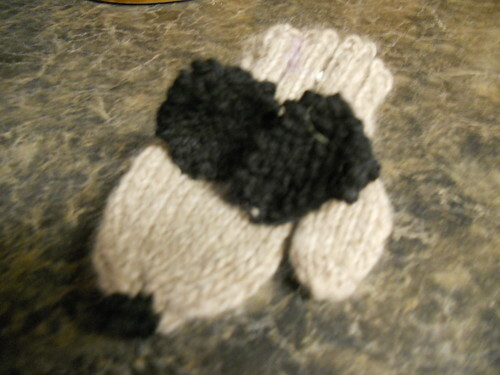 Add a little pink thread and VOILA, I have cute little bunny mittens! 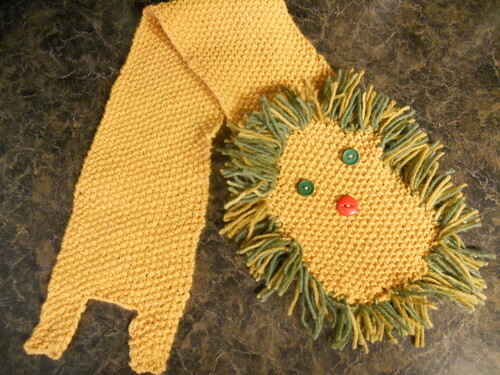 I'm also trying to locate some type of tool to help me make a pom-pom for the tail. 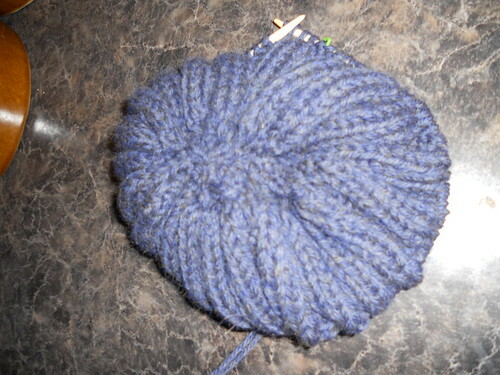 The last time I made a pom-pom like that I ended up having the thing fall apart on me. If I'm going to be donating this (or whatever-ing this) I do not want it to fall apart!!! 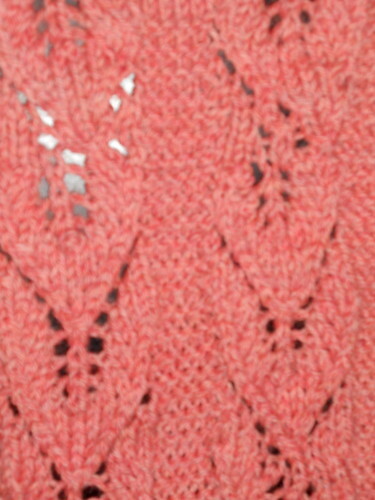 Idea is that gold is loose strand then you knit with burgundy and when pulling up the gold use gold. After about 12 rnds of color A being the base color I switched to color B being the main color, then after about 20 rnds of B being the main color I switched back to color A being the main color and finished off the hat. 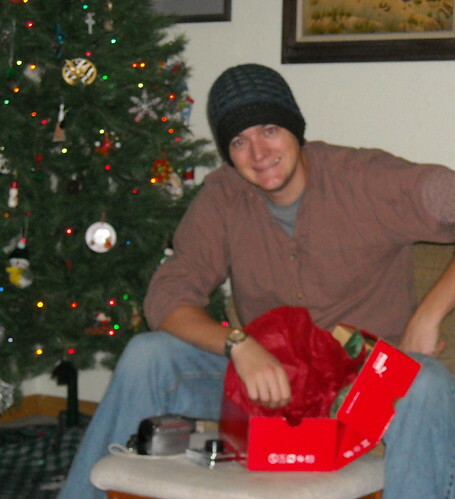 I will probably eventually add a piece of fleece inside the hat. 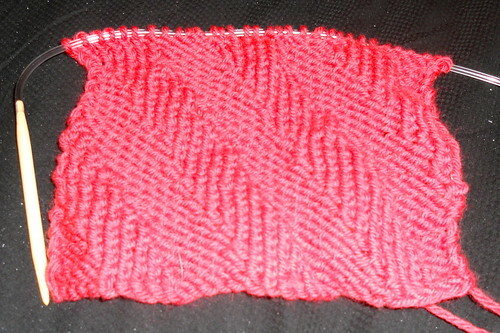 The slip-stitches cause a lot of strings inside the hat. If you do the color changes as I have done you will notice even more strings lining the inside. 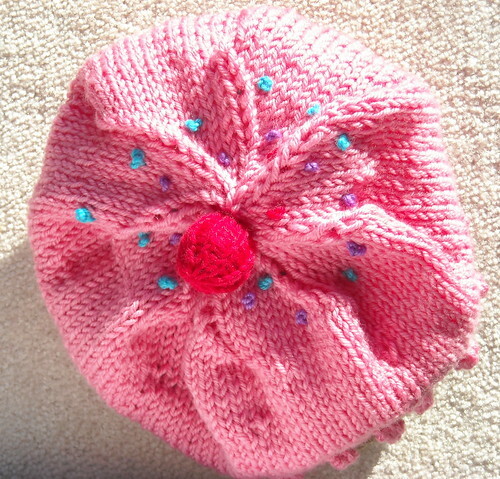 Make sure to knit somewhat loose so that the hat is not too tight when you are finished! Hope you enjoyed! If you would like to see more pictures check out my Flickr Account. This hat was created for my brother. This was yet another pattern that I knew just had to be made for a family member. I found the perfect colors a nice brown, green, and blue. 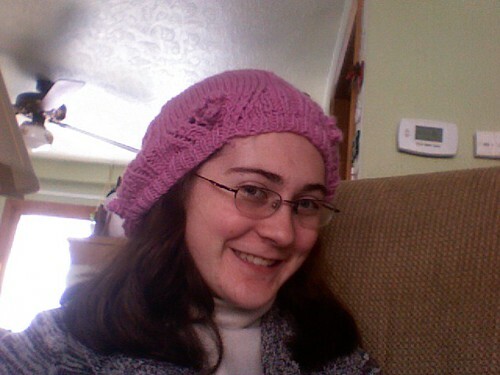 This hat was a very simple and quick knit, but not boring at all. I hate patterns that are repetitive without any color changes or changes in pattern. They are easy, but I get bored easily. This pattern had just enough change to keep my attention and keep me knitting. For more pictures take a look at my Flickr Account. 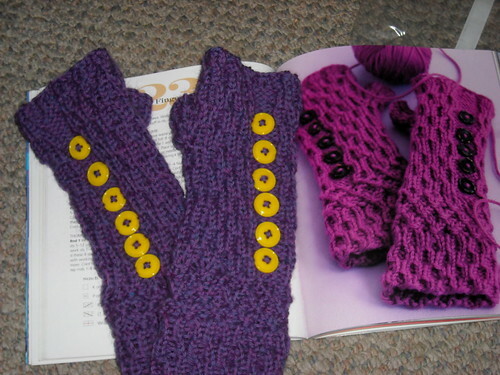 The Checkered Mittens were one of the first projects I made from the 60 Quick Knits book. As soon as I saw this pattern I thought of my mom. I started and finished them in July but my mom did not receive them until Christmas Eve. I enjoyed making them, though the thumb was a bit difficult. I noticed after completing them that there was an errata on the thumb. I did not use the errata, though I just adjusted them on my own. The other thing I would like to change is the height of the mittens. I think they seem a snug on my fingers, but my mom has a smaller hand so they work for her. 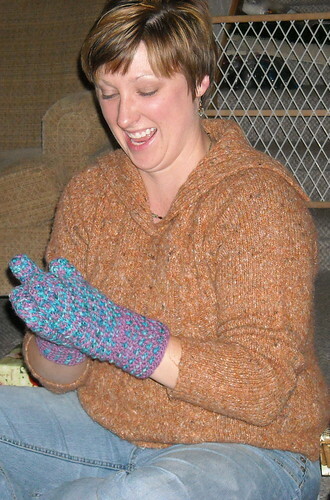 After my mom received the mittens she said that they seemed very warm. I told her that they were made of wool. She was surprised at the quality of wool and the fact they were not itchy. 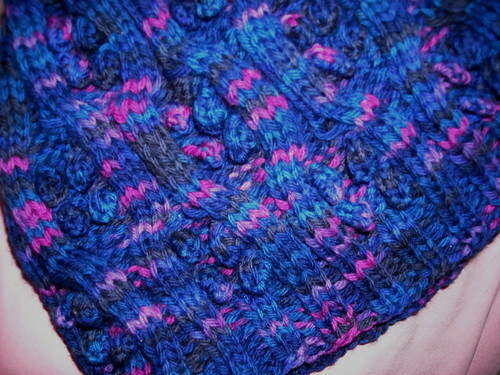 This is one of the many reasons I love Cascade 220 yarn. It is warm, quality wool that does not cost an arm and a leg to buy. For more pictures check out my Flickr Account! I know in the picture (in the book) it was kind of short too, so it may just be the pattern. My friend Katie was happy with the finished product, which is all that matters. Right? If you would like to see more pictures check out my Flickr Account. Em (of EMBellished Knits) and Brittany (of Britter's Little Critters) decided for New Years to come up with a resolution. Instead of trying to lose 50 pounds, get a boyfriend, travel the world, or some other really unrealistic goal, we decided to knit the entire 60 Quick Knits Book by Cascade!!! This blog is a blog for both of us to update everybody on our adventures in knitting these awesome projects! Stay tuned and please follow us to see how we are going to make our dreams come true!